There is a new reality for leaders today – you must lead change to thrive. The pace of change in the market can disrupt your organization quickly. Leaders must anticipate change to lead change. To ignore the realities of change will put you at a major disadvantage often letting the forces of change dictate your future. Whatever the realities for your customer yesterday, you can be sure that those realities are shifting quickly. Be intentional and engaging with the customers you serve. Passive customer surveys will not be enough. What is changing for the customers you serve? How have their needs changed? What is on their mind? Find ways to codevelop with your customers. Invite them into the dialogue about solutions that best serve them. Don’t assume that the metrics and knowledge you have on your customers is spot on. Keep your customers close and you will be better equipped to lead your organization to serve the current needs and realities of the customers you serve. Your suppliers, vendors, and business/ministry partners are feeling the impact of a changing market. The changes taking place globally are sure to have an impact on your organization either directly or indirectly. Don’t be caught off guard by a key partner going under. Run scenarios and have options for the ebb and flow of market changes. Your organization needs new skills, new knowledge, and new tools to succeed in today’s climate of change. Development of your team must be a top priority for you. It will be more than increased competency within a discipline. It requires knowledge across disciplines to succeed. Create a development culture where learning and sharing knowledge is a core value. Every person on your team needs an active development plan that your resource and support. Watch the trends of generational changes on your team. In the next few years you will see a major shift in your employee mix as boomers retire and millennials become the drivers. This shift will require a new way of doing work. Do you know your culture? Culture is how work gets done. It is the heart of your organization, its values and behaviors. Peter Drucker is credited with saying “culture eats strategy for lunch.” The world of work is shifting under you right now. The way work gets done is shifting. Unless you lead the shift, your culture will eat you for lunch! The digital revolution, globalization, the millennials are all driving the need to empower your work force to own the work. Your mission, purpose, and compelling vision for the future have never been more important for creating a culture of people that are so committed they will work together to solve problems, advance opportunities, to learn and adapt because who you are as an organization matters to them. Culture should be part of your strategy for success. A top down, hierarchical culture will not be able to move fast enough to proactively respond to the changes happening in today’s market. This is an exciting time to lead an organization but it requires a leader who is actively engaged in anticipating change and leading the way to an exciting future. 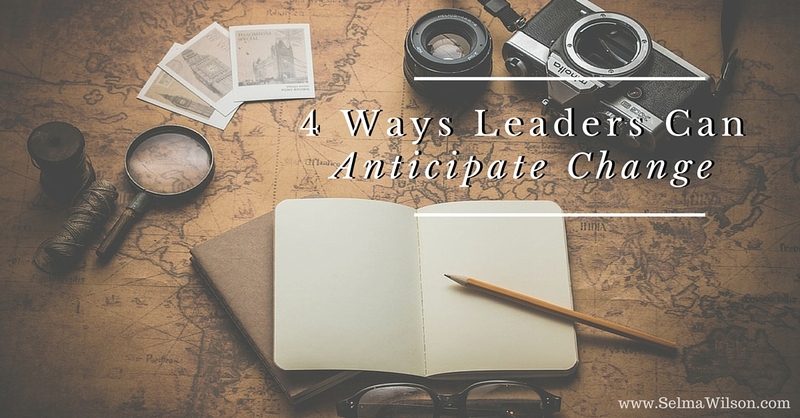 What are you doing to help you anticipate change?